Ketubot Art is such an important and time honored tradition. Something so beautiful and unique deserves a work of art that can honor that tradition perfectly — something that will be influenced by our roots and background. 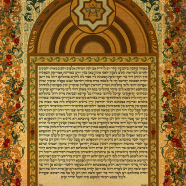 The Amsterdam Ketubah by Orthodox Ketubot is a beautiful work of art that exhibits the Jewish influence in Holland throughout many centuries. The intricate design and soft colors is a blend of Sephardi and Ashkenazim tradition and makes for the best Historical Ketubah out there.